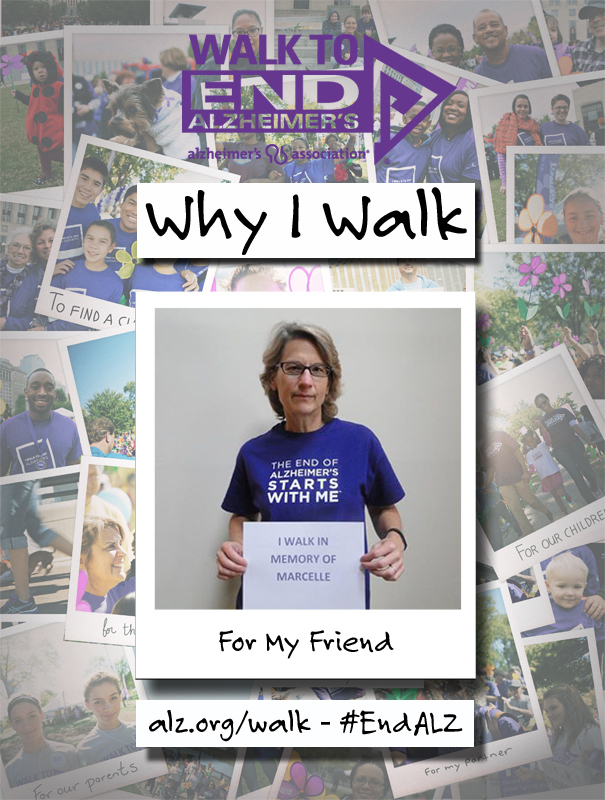 My name is Michelle Gomez and I Walk to End Alzheimer’s in honor of all those affected by the disease – their caregivers, their families, their friends. I Walk to support and advocate for the residents and families at Greenfield Senior Living communities, where I work. Prior to my employment at Greenfield, I never saw first-hand how Alzheimer’s and dementia impacts so many lives, and my eyes have been opened to a heart breaking journey. I listen to the stories of our residents. Who they once were. Who they are now. I am here for these families, to reassure them, to share their stories, their challenges. I let them know that if they can’t cry here, where are they going to cry, and I have shared their tears. I remind them to live in the moment – every single moment – and enjoy these moments as much as possible. This year, I am also delighted to be the 2015 Fredericksburg Walk to End Alzheimer’s Chair. I am proud to champion the cause and to engage and motivate others in our community to get involved. Together, we can and will stay strong, walk on, and end Alzheimer’s! You can now register for the 2015 Walks to End Alzheimer’s. 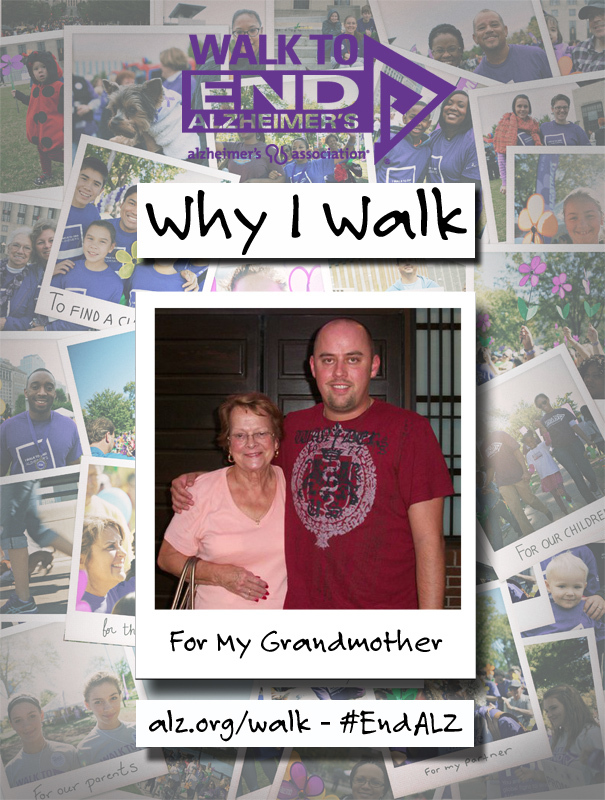 My name is Brad Fleenor and I am the 2015 Richmond Walk to End Alzheimer’s Chair and I Walk to End Alzheimer’s for my grandmother Mimi. My Mimi, was diagnosed with Alzheimer’s in 2008 and from that moment on, my family has been deeply impacted by this disease. One spring day, while I was living outside of Atlanta, I called my Mimi for our weekly chat, and she said how much she missed me and was coming to see me. This completely caught me off guard. My Mimi, at the age of 74, driving through downtown Atlanta? I thought this must be a joke. Much to my surprise, that weekend, Mimi called me as she was coming through Atlanta stating that she was almost to my house. Now, this must seem like normal to you, but it certainly is out of character for her. Mimi would never drive that far alone. That visit turned into a three-month visit and we had a great time during her extended time with me, from cooking dinner together, to going out and exploring Georgia. Life moves by so quickly, and if we had only connected the dots back then, I believe we would have all chosen to get to spend three months with our vibrant grandmother. I was the first grandchild, and clearly I was the favorite, so I thought. Now I know all her family was special to her. This was truly her last road trip by herself. Later on, our family moved from the happy times, laughing and celebrating life, to my Mom and Dad faithfully taking care of her day in and day out. Having Mimi live with them, assisting her with her daily life activities, was not a choice, it is what they did. We did not have to sacrifice family time, our family was growing, with my sister expecting her first child and Mimi going on all our family trips and vacations, to Massanutten, Virginia Wineries, Charleston, Nags Head and Fort Lauderdale, we sure did have fun and as my Mother always says, “we made memories” during these difficult times. As time went on, the care became too much for my parents to handle, eventually moving Mimi back home to her same town in Liberty, Kentucky, to be near her other children and grandchildren. With my Mom and Dad making many trips to Kentucky to visit Mimi, things would never be the same. After a while, Mimi did not know them and now lives in her own world each day. Why is life so cruel, to take something so precious away from our loving family and rob us of our Mimi? Mimi is still with us in body, however, in spirit she has crossed to the land of memories. I know that she would be very proud of her family. So the reason I Walk and volunteer for the Walk to End Alzheimer’s, is very simple, to give hope to those who cannot speak anymore. To be the rock for those who need a shoulder to cry on. And most importantly, to keep the memory of my Mimi alive in my heart! 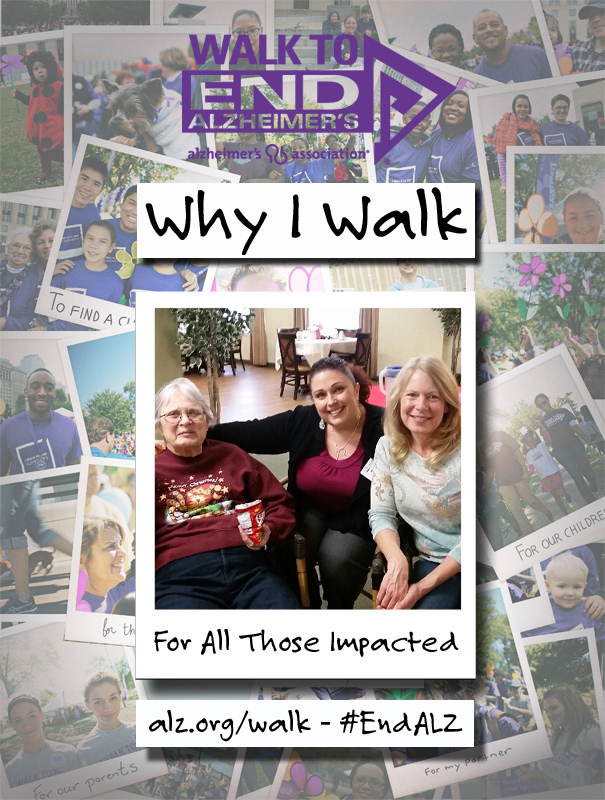 The Richmond Walk to End Alzheimer’s committee and volunteers are some of the most dedicated, passionate and challenge driven individuals that I have ever met and I hope that you join us for this year’s Walk on Saturday, November 7th. 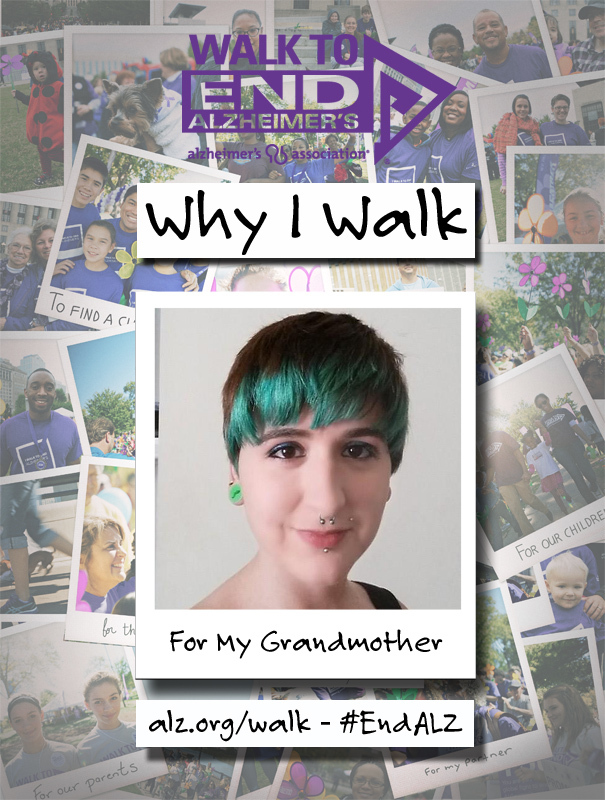 My name is Elise Patterson and I Walk to End Alzheimer’s for my grandmother and great-grandmother. Alzheimer’s is prevalent in my family, with my great-grandmother being diagnosed before I was born. I Walk for her and her memory. My grandmother was diagnosed with Alzheimer’s nearly seven years ago. It has been upsetting to come to the realization that my extremely intelligent grandmother is no longer able to carry on a conversation about our mutual love of literature, particularly Shakespeare. Because I live hours away from home, I do not see her as often as I would like, and now I am afraid that every time I see her, she will no longer recognize me. So, I also Walk for her and in her honor. The Walk to End Alzheimer’s is an unforgettable experience! Just being there, seeing so many people Walking in honor of those they love, or in memory of those they’ve lost was so inspiring. Everyone needs to get involved. If Alzheimer’s hasn’t touched your life yet, just imagine what it would be like to go home and have your own mother, or grandmother, not know who you are. View you as a stranger. Nobody should have to go through this terrible disease, and neither should their loved ones. We CAN end Alzheimer’s by coming together.